Just like today, in the late 1900s, Omahans wanted to hang out and have fun. To make friends, keep social ties strong and pool their resources, they formed social clubs based on ethnic and cultural ties, professions, and neighborhoods. One of these neighborhoods was located immediately west of the old town of Saratoga, and was called Prairie Park. This is a 1958 aerial pic of the neighborhood around the Prairie Park Clubhouse, which was at 2605 Taylor Street from 1911 to 1924. 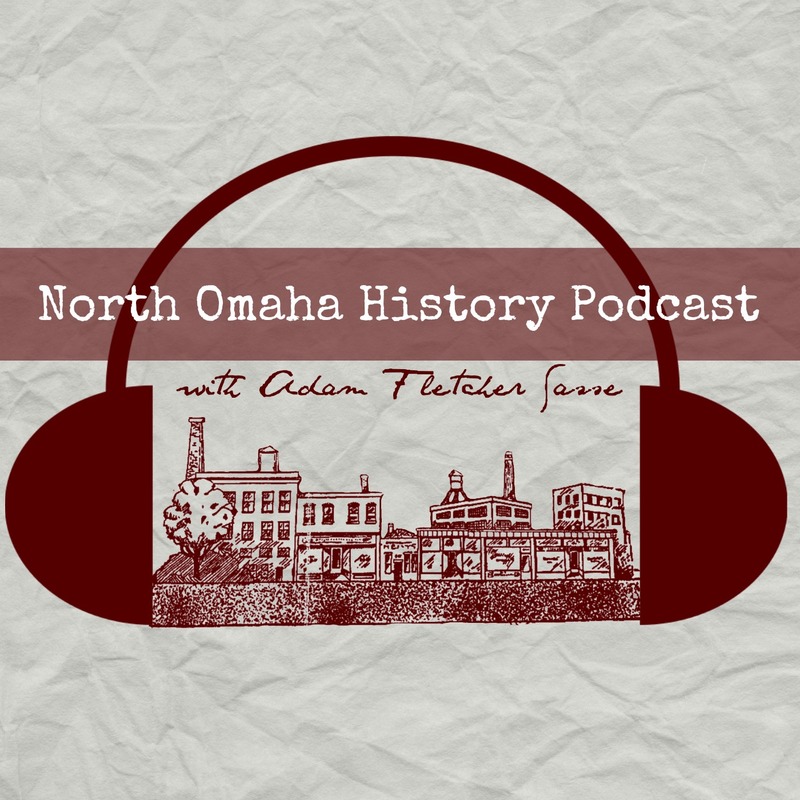 After the turn of the century, the 10 acres between North 25th and North 19th, from Ames to Fowler wasn’t developed yet. When a circus started using the lot in 1907, neighbors weren’t too excited. One of those was H. J. Scannell, a successful businessman who platted the area and sold lots there to ensure the circus couldn’t come back. Before it was built, Scannell placed a number of building restrictions on his subdivision. They included no outhouses of any kind on properties, including garages; no alleys; no wooden or board fences of any kind; and a 23′ setback from the sidewalk. Immediately, people started taking care of vacant lots, planted flowers constantly, and kept the neighborhood well-maintained. To reward the neighborhood’s determination, Scannell bought lots around the Prairie Park subdivision, too, ensuring their care. Over the next several years, neighbors in Prairie Park hung out a lot, including huge “safe and sane” July 4th celebrations, neighborhood picnics, and more. They enjoyed each other so much, they wanted to make their activities more formal. The Prairie Park Club was formed in 1908. By September 1912, the association held formal meetings monthly and social gatherings every week at peoples’ houses and in clubhouses around North Omaha and downtown. Only men were allowed to be members, and the wives were “allowed to use the clubhouse for their social activities,” according to the newspaper. A society page banner from a 1909 edition of the Sunday World-Herald in Omaha. These are images from a 1909 Society section in Omaha’s Sunday World-Herald. Click to enlarge. Informal social clubs like the Assembly Club, the Symposia Club, Kountze Place Tango Club, the Washington Club and the Drama League met regularly at the Prairie Park Club. There was a whist club, and a needlecraft club and a thimblework club met there regularly, too. Club parties, dances, golf club gatherings and a lot more happened there all the time. Every Christmas for almost a decade, the club held an annual party for more than 200 attendees, along with another 200 children. Every year, a children’s choir sang, along with piano recitals, monologues, and a quartet’s performance of “The Christmas Carol.” Santa Claus came from the North Pole every year, and Christmas decorations of holly, mistletoe, poinsettia, and evergreen boughs. For leap year in 1916, the Prettiest Mile Club held a dancing party at the Prairie Park Clubhouse on February 29th. Women were asked to invite men, and the party was supposedly a great time for everyone. This is a 1916 ad for the Prairie Park Club at 2605 Ames Avenue. Promoting classes and assemblies every Tuesday and Thursday, it also hyped dance classes, children’s classes and more. Genevieve Hauflaire was the building manager. This is the Billiard Room in the Prairie Park Clubhouse in 1912. This is a reading room in the Prairie Park Clubhouse in 1912. This is the auditorium in the Prairie Park Clubhouse in 1912. The garage at the Prairie Park Clubhouse in 1912. In 1912, learning how the one-step and waltz canter, mixixe, half-and-half, fox trot and hesitation waltz were all required in Omaha’s emerging middle class culture. The city couldn’t have enough dance halls and clubs, and everyone thought they should belong to one. In 1911, a feature on the club in the Omaha Bee said that “horticulture and floriculture are the hobbies that engage the attention of the grownups of Prairie Park, the ambition of the members being to create a ten-acre prospect that will serve as an example not only for Omaha but for the country. Scannell built the clubhouse for the Prairie Park Club in 1911. Incorporating soon after, the organization focused on social activities and recreation, and to improve their neighborhood. They built a three-story brick building, with a 12-car garage, a public auditorium and dance hall, a club room with a kitchen, a billiard and pool hall, and an office and janitor’s room. It was built on land that cost $12,000, and Scannell leased the building to the club. The address for the club was listed with several different numbers, including 2605, 2607 and 2610 Ames Avenue. The building’s floors each served a different job. As usual, the basement held a furnace and hot water heater. The first floor was the parking garage, except for a small office and janitor’s quarters. There was also a locker room for tennis players. The club room was on the front of the second floor, with a fireplace, two stained windows taken from the original Paxton Mansion that was destroyed by fire, with oak woodwork covering everything and maple floors everywhere. Double doors connected the club room to a hallway that led to the dance hall. The auditorium was 38’x40′ and sat a total of 400 people. There was also a balcony that could seat 100 people, or hold a large orchestra. With a high ceiling and great lighting, oak paneling covered the walls in the dance hall and auditorium, too. All of the furniture in the was oak. Every room in the building had outside windows, and there were large chandeliers throughout the building. On the top floor, there was a cloak room, toilets and a kitchen, which was connected to the auditorium on the second floor. Annual banquets and special events were taken care of with this set up. The billiard room and pool hall were on the top floor too, along with card rooms. Aside from the main staircase, there was a separate set of stairs outside the building to reach the top floor. Before the City of Omaha had a robust Parks and Recreation Department, groups like the Prairie Park Club were vital in promoting sports, outdoor appreciation and conservation. In a 1911 edition, the Omaha Bee named the Prairie Park Club in league with the Omaha Country Club, Happy Hollow Club, Field Club, Dietz Club, the Omaha Rod and Gun Club, the South Omaha Country Club, the Miller Park Club (which became the Prettiest Mile Club), and the Omaha Aero Club. They each had their own sporting grounds, and several had expensive club houses. In April 1912, the club announced the opening of its new tennis courts, even before the clubhouse was finished. Located at the southern end of the club’s future property, the courts were at North 26th and Sahler Avenue. Men’s and women’s matches were held, and the club joined the Omaha City Tennis League. By 1914, the club had three clay courts, one for men, one for women and one for mixed sets. There was an annual duel for club champion too, and the courts were busy from spring through fall. Did Controversy Bring It Down? In 1914, the club called off their seven-year tradition of hosting a large, whole-neighborhood July 4th party. There was no announcement for their Christmas party that year, either. The Douglas County Health Department had ordered smallpox vaccinations for all children. Despite that, the Prairie Park neighborhood resisted and used their club as a rallying point to continue that. In late March, the newspaper ran an article explaining why their resistance continued. Committing to start a booster club for anti-vaccinations, the group found dwindled support but charged on. In November 1917, there was another article in the newspaper affirming their stance. Apparently, the president of the club wasn’t speaking for the club when he talked to the paper. Soon after in 1917, activity announcements for different events at the club stopped appearing in the Omaha World-Herald. The paper published a lot of activities at the Prairie Park Clubhouse before that point, and kept publishing other clubs’ social activities and more afterwards. The Prairie Park Club simply stopped appearing. There was a blip in the newspaper about parents from Saratoga still resisting vaccinations, but there was no mention of the club. In 1920, about 65 people met to create a new group called the North Side Club. Their first meeting was at the Prairie Park Clubhouse. There was no talk of the old club though, or its building. Then, in June the clubhouse was put up for sale. Priced at $18,000, it was for sale by Payne Investment Company in downtown Omaha. I found a reminiscence about the Prairie Park Club House in a 1944 edition of the newspaper, where the writer was remembering fun times during World War One, and begged their readers to remember with them. The clubhouse really left an impression on people. After scouring the newspaper archives and other sources for hours, I can’t find what eventually happened to the clubhouse. I would imagine it became an apartment building, or more fitting with the neighboring light industrial buildings, perhaps a manufacturing facility or warehouse. There were regular floods in the neighborhood, and as white flight got worse in the 1960s, crime increased and police patrols dropped. The entire block where the clubhouse sat was demolished by 1983 to make room for the North Freeway.